Pondicherry - this place is very special to me, yes its my hometown. Pondicherry is in Southern part of India, its one among the Union territory, we have our chief minister and a chief secretariat.Pondicherry, heavily influenced by French, we have the street names in French, yes The french way of life left a deep impact in our lifestyle and in our cuisine. Pondicherry cuisine, is a mixed cuisine of French, Tamilnadu, Andhra, Kerala and with some Bengali touch too.Pondicherry cuisine involves many spices,obviously gravies and side dishes are prepared basically with mixed paste of coconut,poppy seeds and cashewnuts or simply stir fries have grated coconut definitely in it thus this cuisine have very rich flavourful dishes.Pondicherry is one of the famous tourist place and now its one of the fetish place for movie shootings,you cant miss a movie shooting atleast once a week, because of this many 5 stars hotels are showing their head here and there in Pondicherry. Pondicherry is called French Riviera of the East. Been born in Pondicherry, i have been pampered by many traditional dishes and when i was about to chose a traditional dish i picked Assaadu which means literally Kurma. 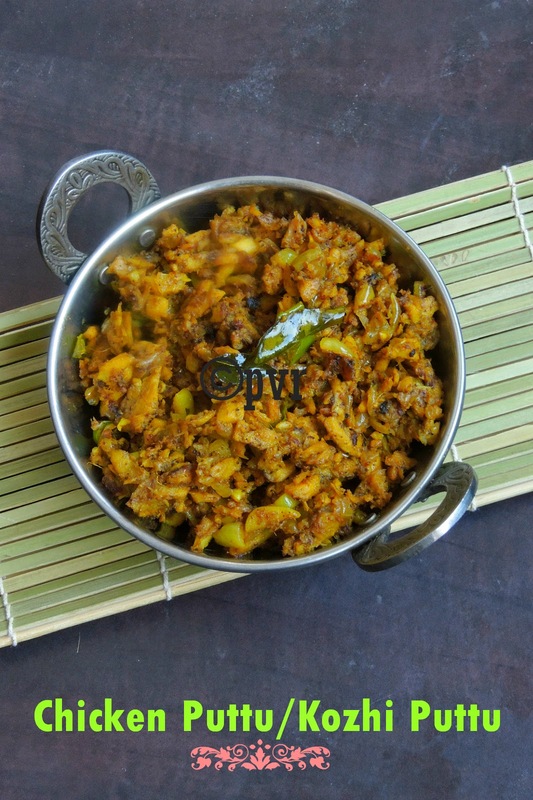 Christian community in Pondicherry calls their kurma as assaadu and this dish is prominently prepared with meats or seafoods, but i prepared mine simply with potatoes. You might have heard the name kavappu which means bhajji, the gramflour coated fritters. Most important spices cooked in this cuisine is peppercorns,fennel seeds, cumin seeds,poppy seeds,coriander seeds. Since Pondicherry is situated near Bay of Bengal, we are seafood lovers and we get super fresh seafoods. My today's post from my place is Potato Assaadu and chicken puttu aka shredded chicken, actually we make puttu with shark fish/Sura meen which is quite famous in my place, i simply replaced the shark fish with chicken.Both dishes served with rice makes a satisfying meal definitely. Grind the fennel seeds and cumin seeds as fine powder, keep aside. Grind the grated coconut,poppyseeds, cashewnuts together as fine paste. Heat enough oil, fry the cloves,cinnamon stick, bayleaf until they turns brown. Add the chopped onions, ginger garlic paste, cook for few minutes. Add the tomatoes,slit opened green chillies, fennel-cumin seed powder, salt and cook until the veggies gets well cooked. Add the cubed potatoes, cook for few minutes. Finally add the grounded paste, add enough water and cook everything simmer until the veggies get well cooked. Add the coriander leaves, put off the stove. Add the pepper powder, cumin seed powder, turmeric powder, fennel seed powder, salt to the shredded chicken and mix everything well. Heat enough oil and let splutters the mustard seeds,curry leaves and urad dal, add the chopped ginger,chopped green chillies and chopped garlic pieces and fry until they turns slightly brown. Add immediately the chopped shallots and cook everything until the shallots turns transculent. Now add the cooked and spiced chicken and toss everything gently, cook everything in simmer until they turns dry and get well fried.. Both of them look awesome sis .POtato assaadu means what potato kuruma ?Chicken looks awesome too being a vegeterian i cant taste it . I regularly visit Pondicherry and it's a lovely place. Loved the look of both the preparations. Particularly the shredded preparation. both the dishes are super tempting akka. I loved chicken putu, a really unique dish...will tryout soon. Awesome recipe to share priya..Yummy exotic ! Both recipes are making me drool. But im eyeing on the chicken puttu. New dish to me and have to try this. Unga ooru recipes aachae.. summa kalakkala irukku akka.. super ah panni irukinga.. wish i could taste it..
ஐ! நம்ம ஊரு சாப்பாடு,செம...பார்த்ததும் மறுபடியும் சமைத்து சாப்பிடனும் போல இருக்கு!! yumm, love the chicken dish especially. Both sounds like a must try Priya. I have prepared something similar to the chicken puttu, though the chicken was not shredded, but cubed. As always, loved reading through your intro. The chicken is making my mouth all watery........excellent recipe!! Awesome ! both looks mouth watering. glad to visit your hometown through you virtually , these are beautiful dishes that you have picked for us.. Very good recipe Priya, I miss Pondy food... luv the chicken puttu, my MIL use to make this and we go gaba gaba with hot steaming idlis! The assaadu looks yum and is quick to cook. Never heard of assadu . Very interesting. The recipe for the potato curry is a tad bit different, must taste amazing ..
you guys are doing such hard work with this marathon.. Really impressed ! Thank you for sharing these traditional dishes from your hometown. Both of them look so delicious. The kurma looks interesting, Priya. 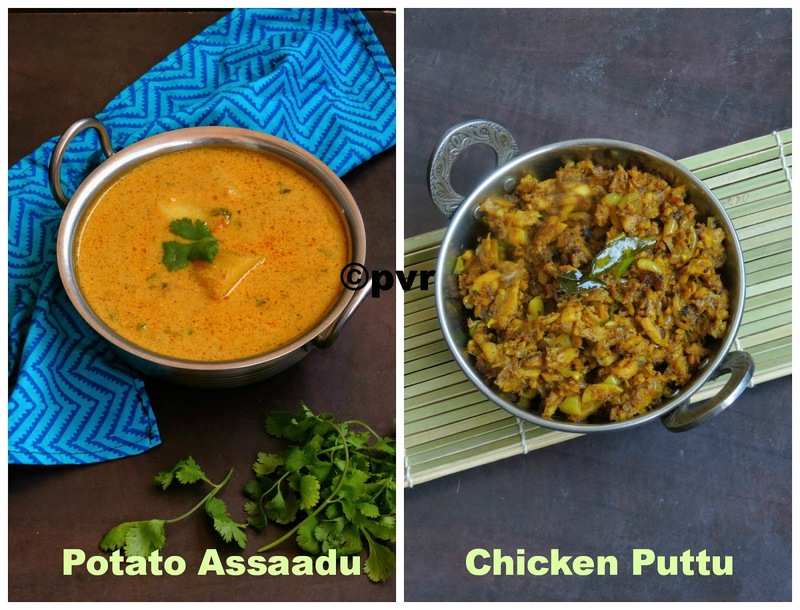 Both the dishes looking so yummy ..Potato assadu looks so creamy and chicken puttu sounds inviting..Bookmarked the recipe,will try it soon.. It is nice to know that assadu is nothing but kurma. Both the dishes look delicious and nice write up about the cuisine. Thanks for the info on the state. 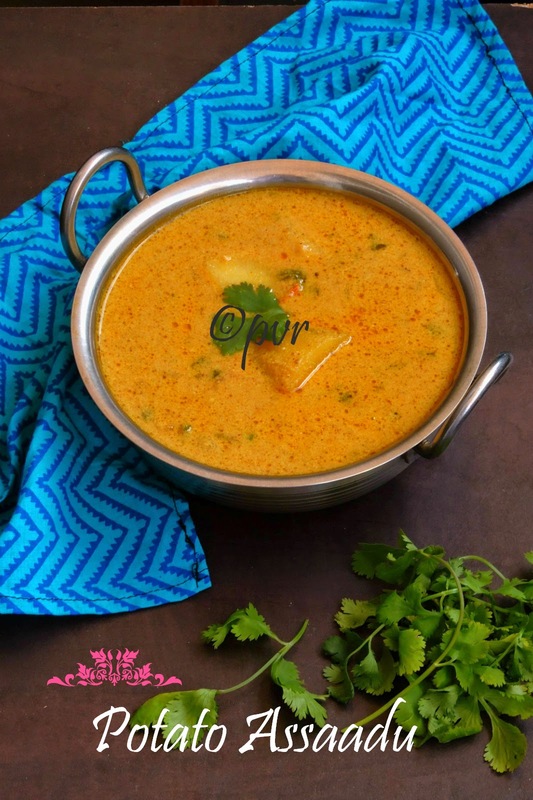 vegeterian assadu is very interestin aks love the way you have made the kurma like gravy pondy spl with potato :) Pondy girl we are expecting some more traditional recipes from your native aks :) curry looks very tempting !! Glad to know tat ur from my place(pondy).. u have a very nice collection of recipes.Bookmarked ur blog.. Delicious! I wanted to read what you do for ages but I did not dare to jump the line. Loved the intro too. I want to visit Pondi especially to eat fish.